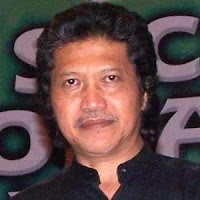 Muhammad Ainun Najib or commonly known Emha Ainun Najib or Cak Nun born in Jombang, East Java, May 27, 1953. He was the fourth child of 15 siblings. His father, the late MA Latif, was a farmer. He received his elementary education at Jombang (1965) and SMP Muhammadiyah Yogyakarta (1968). Modern cottage had entered Gontor Ponorogo but later excluded because the demonstration against the government in the middle of the third year of his studies. Then I moved to SMA Muhammadiyah, Yogyakarta until graduation. Then had continued to UGM Faculty of Economics, but did not graduate. Only formal education ended in Semester 1 Faculty of Economics, University of Gadjah Mada (UGM). Five years of living homeless in Malioboro, Yogyakarta between 1970-1975 when studying literature to teachers who admires, Umbu Landu Paranggi, a mysterious and mystic whose life greatly influence the course of Emha. He also participated in theater workshops in the Philippines (1980), International Writing Program at the University of Iowa, United States (1984), International Poets Festival in Rotterdam, The Netherlands (1984) and Horizonte Festival III in West Berlin, Germany (1985). In daily life, Emha directly involved in the community and doing activities that summarizes and integrates the dynamics of art, religion, political education, in order to foster economic synergy potentialities of the people. In addition to the regular monthly activities with community Padhang Bulan Society, he also traveled to various parts of the archipelago, an average of 10-15 times per month with Music Kiai Kanjeng, and on average 40-50 shows a mass which is generally done in the area outside the building. Besides, he also held a Kenduri Love since the 1990's held at Taman Ismail Marzuki. Love is friendship forum feast of culture and humanity are packed very open, nonpartisan, light and wrapped in his cross-gender art. In social gatherings, he did various deconstruction understanding of the values, communication patterns, methods of transportation cultural, educational way of thinking, as well as the pursuit of the problem solutions. Together Music Group Kiai Kanjeng, Cak Nun average 10-15 times a month traveling around to different parts of the archipelago, with a mass event which is generally done in the area outside the building. In addition, on a regular basis (monthly) with community Padang Bulan Community, meeting socially active doing various deconstruction understanding of the values, communication patterns, methods of transportation cultural, educational way of thinking, as well as the pursuit of the problem solutions. In various community forums Community Padang Bulan, it talks about pluralism often. Many times Cak Nun called scholars who reject it straighten understanding of the concept was described as that diversity management. He was always trying to correct a misunderstanding about something, whether errors of meaning and contextual meaning etymology. One is about da'wa, the world which he considered polluted. According to him, there is no parameter who is and is not to preach. "The main Da'wah not with words, but by behavior. People who rented berbuatrumah, in Bugisan, Yogyakarta. Several cities in Java, once they came, for one or two performances. In addition to performing, he also menjasjid, and a variety of community residents was called missionary activities. "It's just been preaching be good," he said. That is why he preferred to have his presence with Novia Kolopaking His wife, known as the artist film, stage, and the singers and musical groups in the park Kiai Kanjeng culture, cyberspace since the late 1970s, working with Dynasty Theatre - based in ntuk service . Service is worship and should be done not only vertically, but horizontally, "he said. His career began as Caregivers Space Daily Literature at the Present, Yogyakarta (1970). Then a reporter / editor at the Daily Present, Yogyakarta (1973-1976), before becoming the leader of Theatrical Dynasty (Yogyakarta), and bands Kyai Kanjeng until now. Poet and columnist in several media. He also participated in various festivals and workshops, poetry and theater. Among theater workshop in the Philippines (1980), the International Writing Program at the University of Iowa, USA (1984), International Poets Festival in Rotterdam, The Netherlands (1984) and Horizonte Festival III in West Berlin, Germany (1985). Cak Nun spur multi-arts life in Yogya with Halimd HD, arts networker through Sanggarbambu, active in theater dynasty and generating some of the repertoire as well as drama performances. Among them: Geger Wong Ngoyak Tigers (1989, about the reign of 'King' Suharto), Statue of Beloved (1989, about the cult); Miracle Lik Par (1980, about the exploitation of the masses by modern institutions); Mas Shaman (1982, about the failure of the institution modern leadership). Moreover, with theater-Salahudin staging rasta rasta Khidhir (1990, on the ground Gontor a player with all the students, and 35,000 spectators in the square madiun). Oceans Veil (1990, staged a mass in Yogyakarta, Surabaya and Makassar), and Kiai Sableng and king Faruq (1993). Nusantara Dajjal Devil World (1997), 2.5 Hours Together Suharto (1998); Dead Ketawa Refotnasi Ways (1998); Kiai topsy turvy (1998); Pilgrimage Elections, Political Pilgrimage, Pilgrimage Nationality (1998); Recycle Bin (1998) ; Pledge Husnul Khitmah (1999); Jogja Indonesia Go Round (2000); Mom son Tamparlah Mouth (2000); Tracing Point of Faith (2001); Lessons Fasting 1 & 2 (2001); Triangle of Love (2001): "Book of Peace" (2001); "Trilogy Collected Poems" (2001); "Tahajjud Love" (2003); "Encyclopedia of Thought Cak Nun" (2003); Folklore Madura (2005); Fasting yes Fasting (2005) and the kingdom of Indonesia (2006, a collection of interview); Pagan Liberal (2006), and, the Silent Street Emha (Ian L. Betts, June 2006). Cak Nun Kiai Music Group Kanjeng along with all-white outfit, air-blessings (singing) with a strong gospel style with contemporary gamelan music accompaniment before the congregation gathered around the stage Cut Meutia Mosque. After tarawih silent prayer, and then the faint sound intro song Silent Night. Then came the poem, "Sholatullah Alamulla / 'Ala Thoha Rasulillah / Sholatullah Alamulla / Sholatullah Alamulla /' Ala yaasin Habibillah / 'Ala yaasin Habibillah ..."
Applause and shouts of the audience was booming after it finished chanted prayers. "No Christian song, no song Islam. I'm not singing, I air-prayers," he said answering a question on the minds of the mosque congregation. It seems Cak Nun seeks to overhaul the way people think about religious understanding. Not only on the performances of the Quran and the Red and White Love My Country in Cut Meutia Mosque, Jakarta, Saturday (10/14/2006) night, he did controversial things. In the formation of communities, an oasis of thought emerged, refreshing hearts and minds. Subject pluralism, often appears in discussions with community Cak Nun. "What is pluralism?" he said. According to him, since the time of Majapahit kingdom was never a problem with pluralism. "Since the days of our fathers, the nation is already plural and can live in harmony. Maybe now there is no intervention from outside the country," said Emha. He emphatically declared support pluralism. According to him, pluralism not think all religions are the same. Islam unlike Christianity, Buddhism, to Catholicism, to the Hindu. "You can not be equated, the difference though is different. We should appreciate it all, "said intellectual humanists.